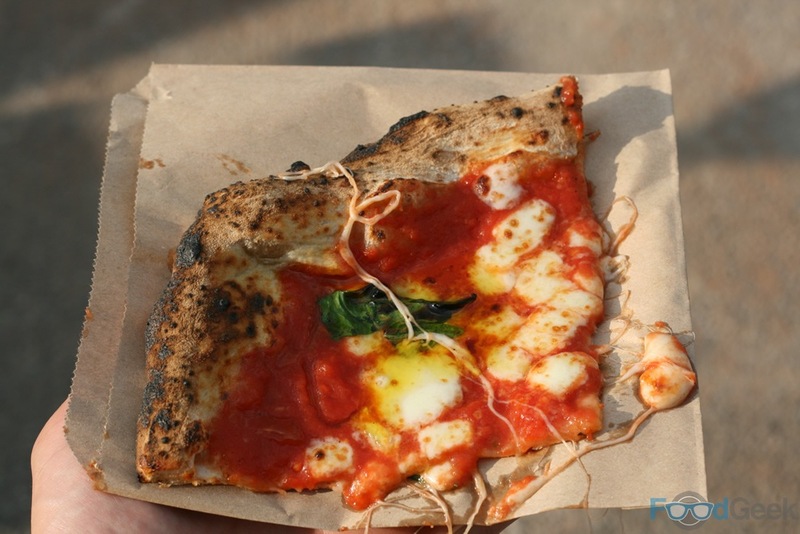 Since having my first ‘Pizza Pilgrims’ at Street Feast London in May i’ve been plotting a return to get another fix. 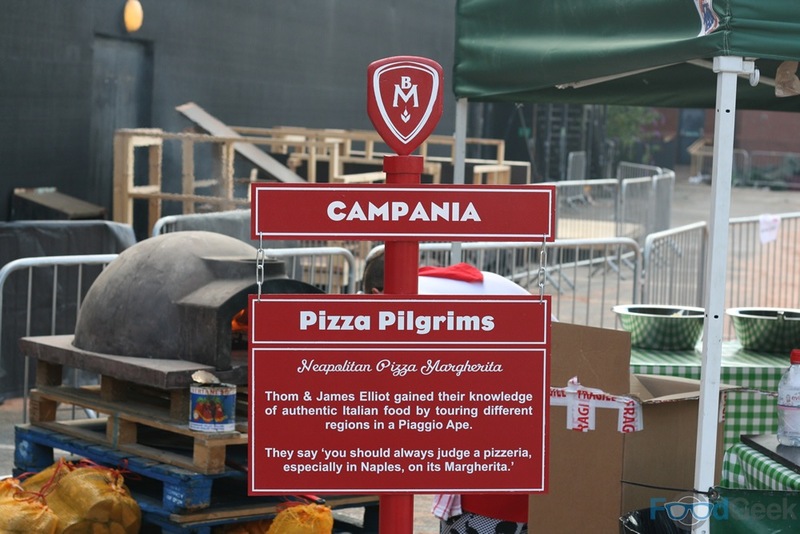 Last week something wonderful happened; Pizza Pilgrims came to me! And they even brought some friends with them. 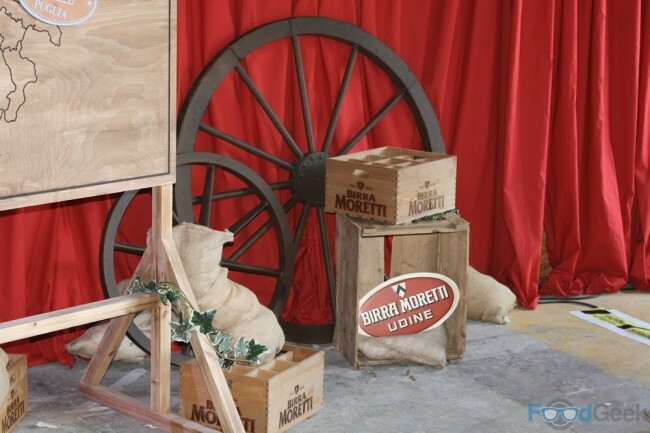 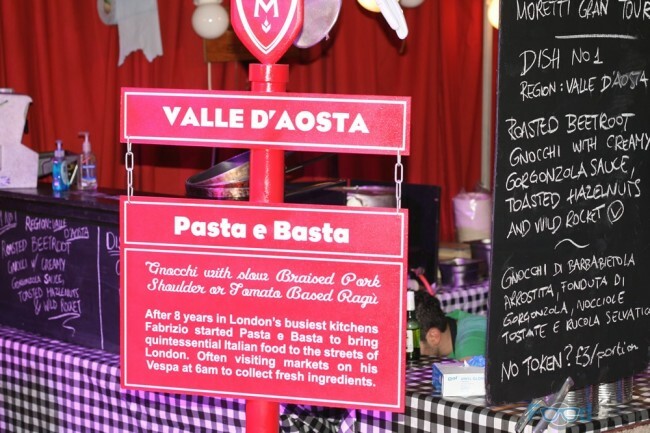 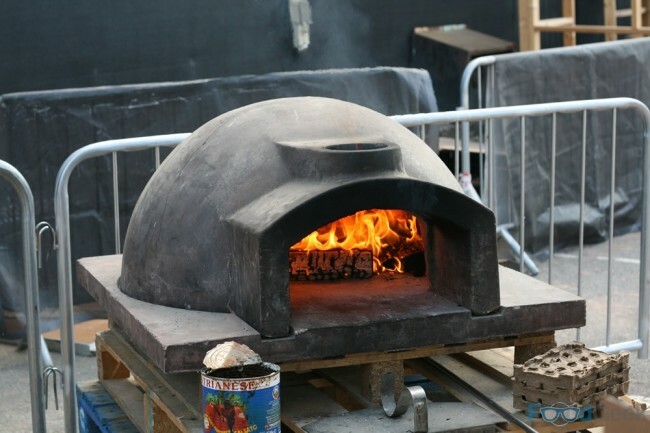 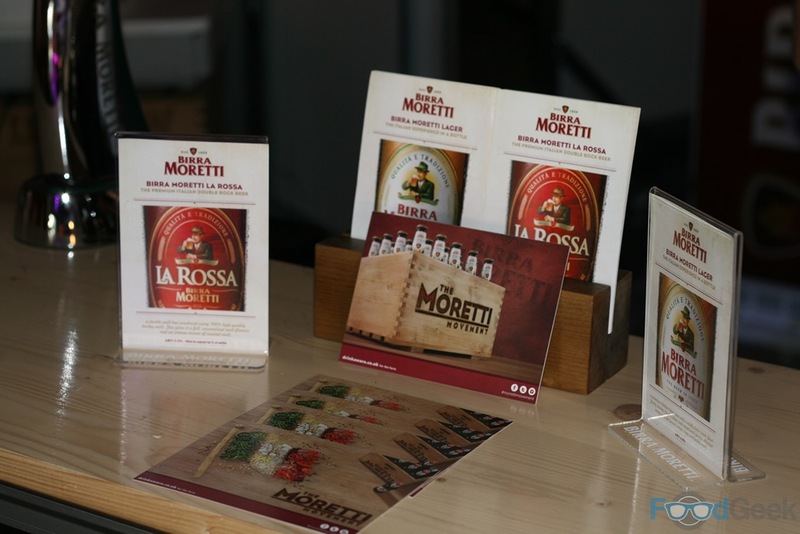 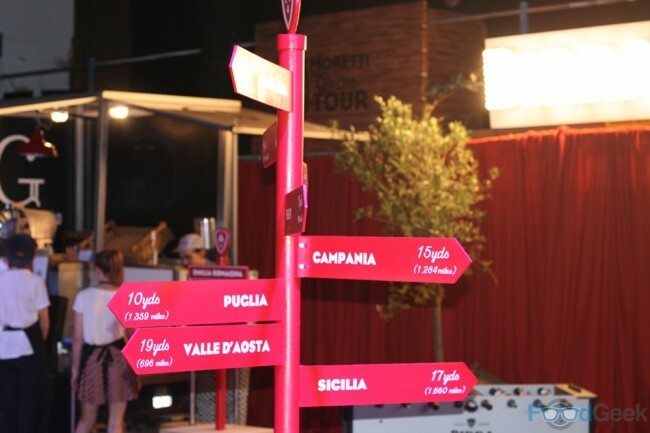 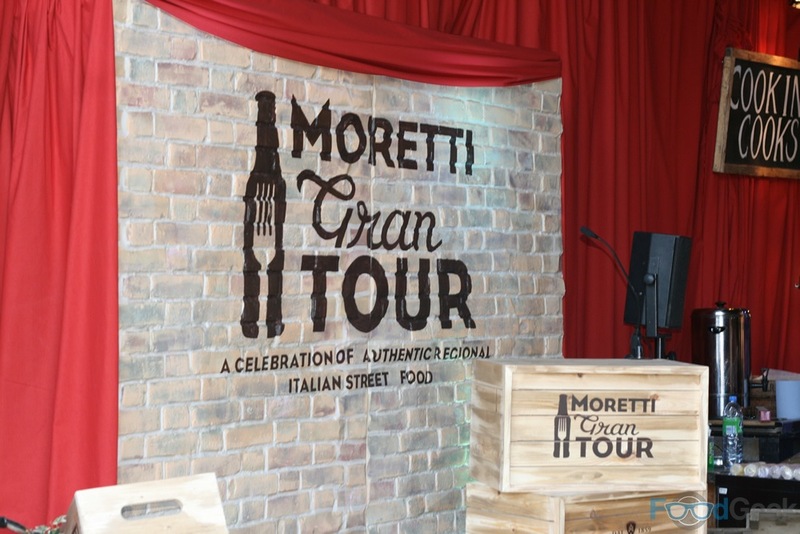 ‘Moretti Gran Tour’ was an event run by Italian brewing company Birra Moretti to celebrate authentic Italian food, featuring some of London’s best Italian street food vendors such as: Forza Win, Gurmetti, Gelupo and of course, Pizza Pilgrims. 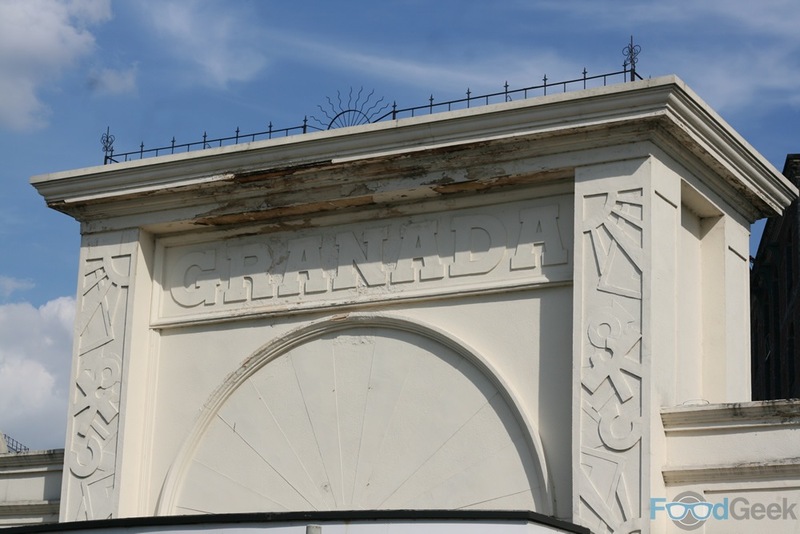 The event is took place at Old Granada Studios last Thursday – Sunday, I visited on the opening night. It was my first time at Old Granada Studios, though similar events have been held there previously. 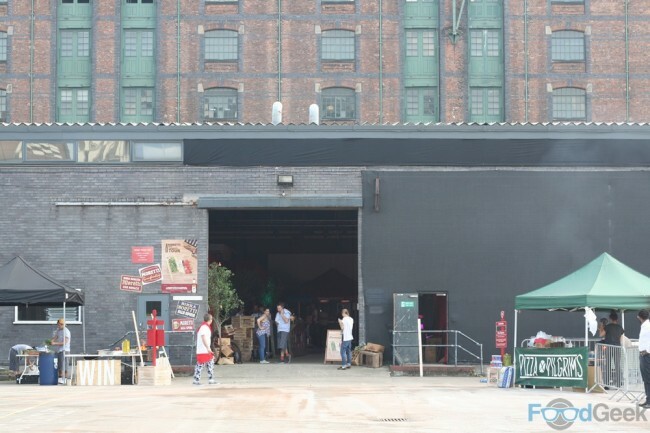 It’s a great venue and just perfect for this kind of thing, with a large open space outside, plenty of room and seating inside too. 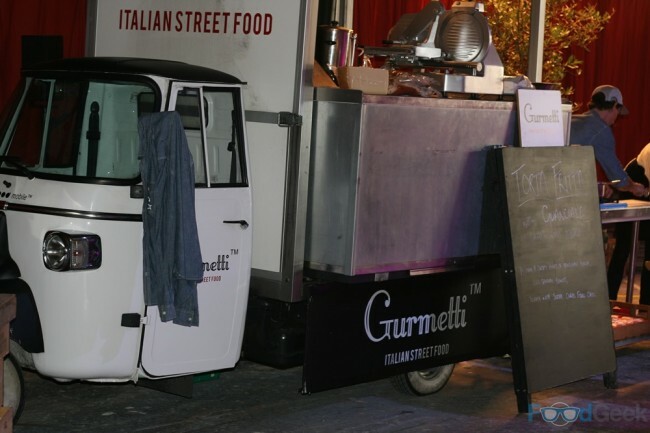 It has that run down industrial look that the likes of Street Feast & B.Eatstreet seem to go for, except this is probably natural. 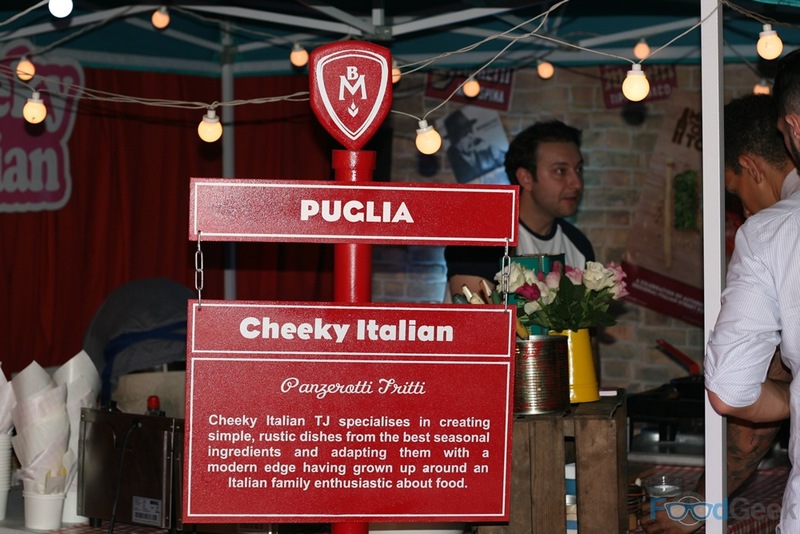 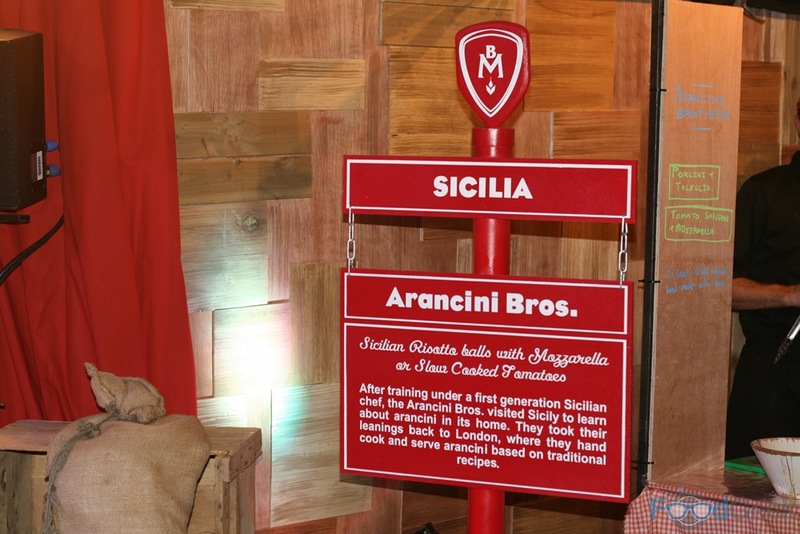 The idea wasn’t simply to showcase Italian street food but to demonstrate the regional differences in Italy too. 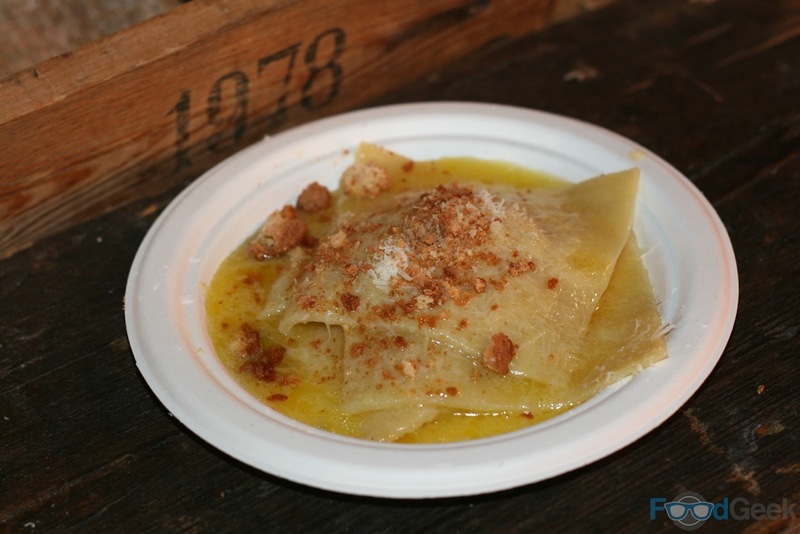 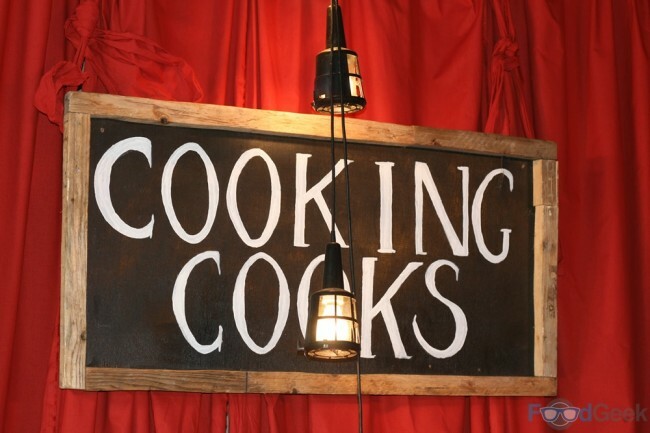 Each vendor was chosen for their philosophy of using traditional and authentic ingredients and techniques from a number of specific areas. 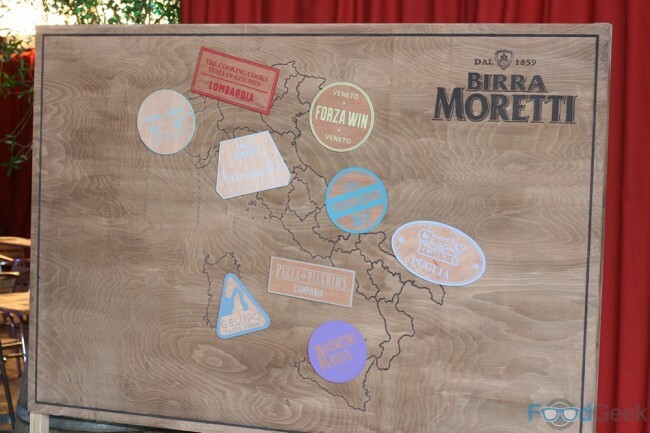 This was highlighted by several maps and and signposts to each vendor who also had a sign outside their stall with details of their own region. 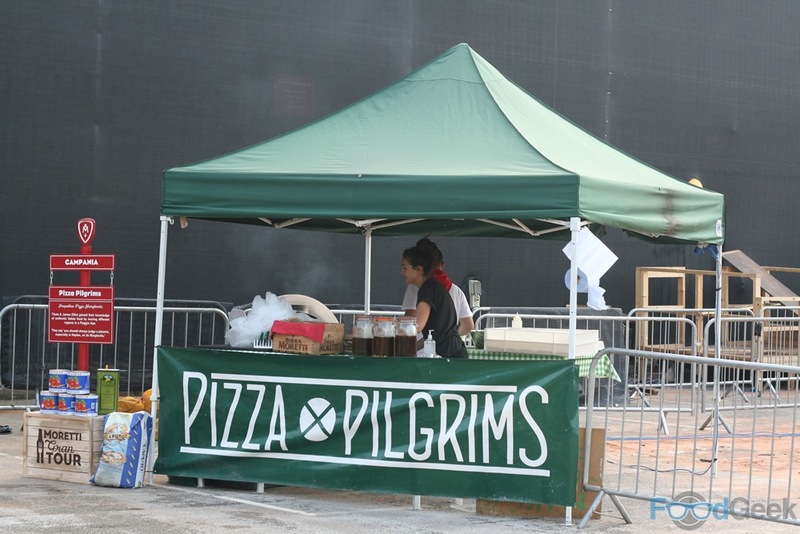 Pizza Pilgrims wood fire oven wasn’t quite hot enough yet so I headed to Sicilia first, for some arancini from Arancini Bros. 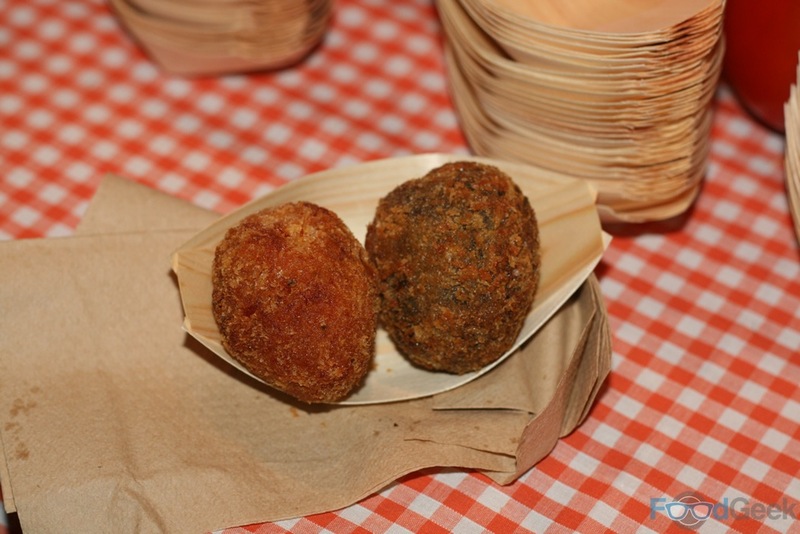 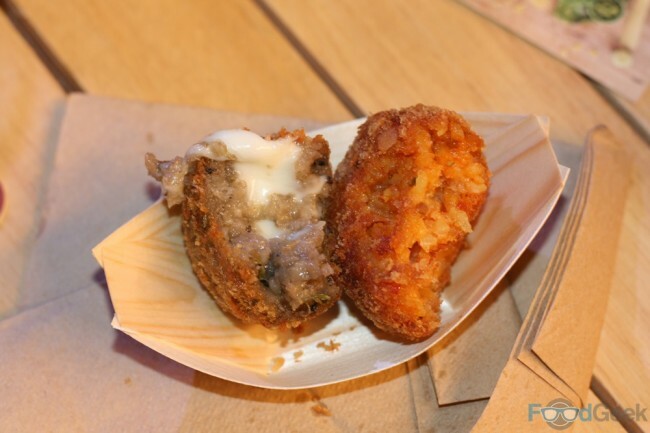 The handmade, deep fried risotto balls didn’t disappoint. The tomato, saffron & mozzarella version was good, the saffron not too overpowering but it was the porcini & Taleggio that I liked best; the deep earthy mushroom flavour complemented the tangy, oozy melted cheese perfectly. 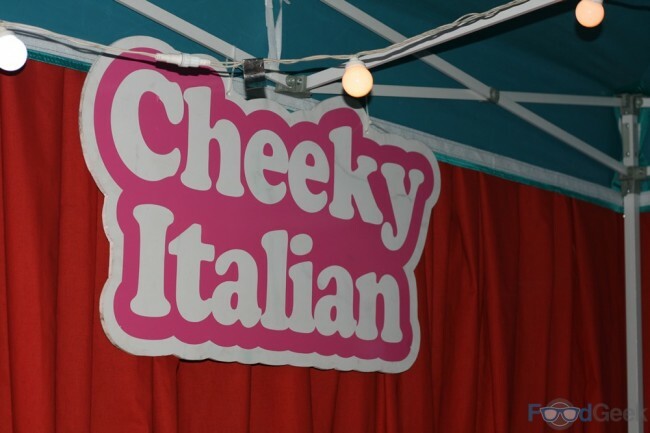 Moving up to the Italian mainland, specifically to Puglia on the southeast coast for a ‘Meatball Calzone Fritti’ from ‘Cheeky Italian’. 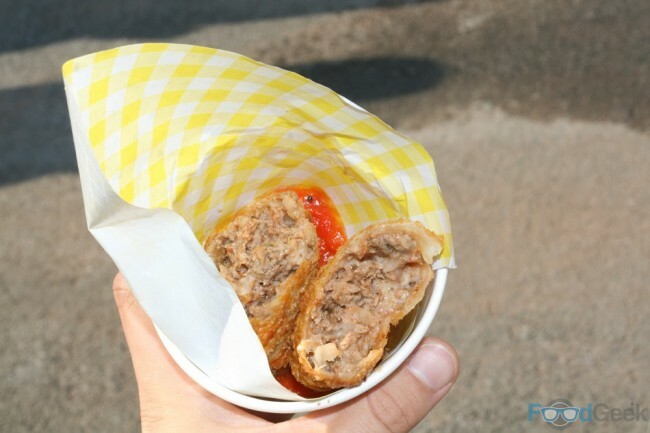 Essentially it’s a fried mini pizza stuffed with meatballs, tomato sauce & cheese! And yes, it tastes as good as it sounds. 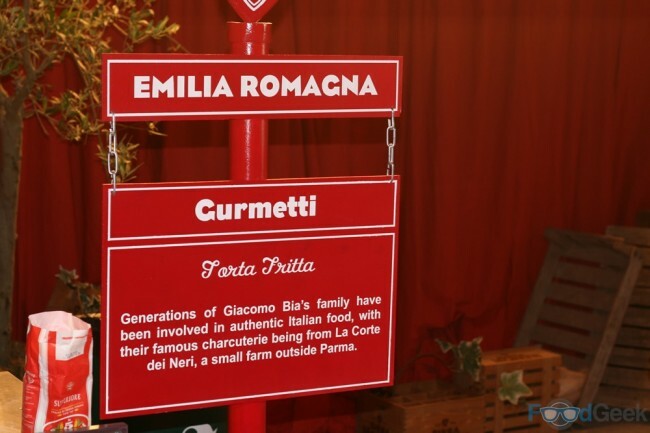 From northern Italy, ‘Gurmetti’ headed up by the charming Giacomo who’s family have been involved in Italian food for generations. 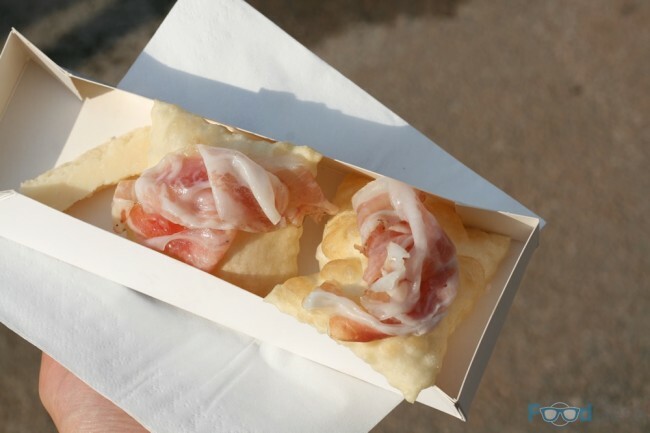 He was serving ‘Torta Fritta’, a simple but delicious dish of traditional fried dough puffs with amazing charcuterie and probably the best parmesan i’ve ever eaten! 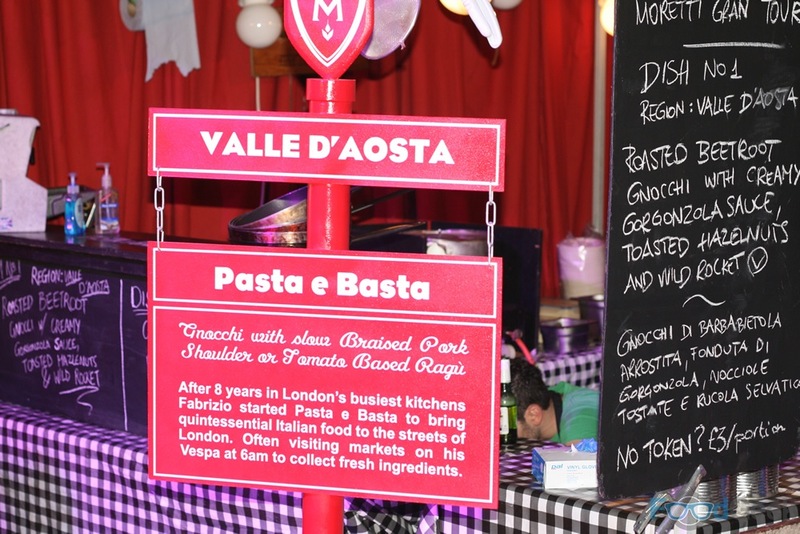 My favourite dish of the night came from ‘Pasta e Basta’ via Valle d’Aosta in northern Italy. 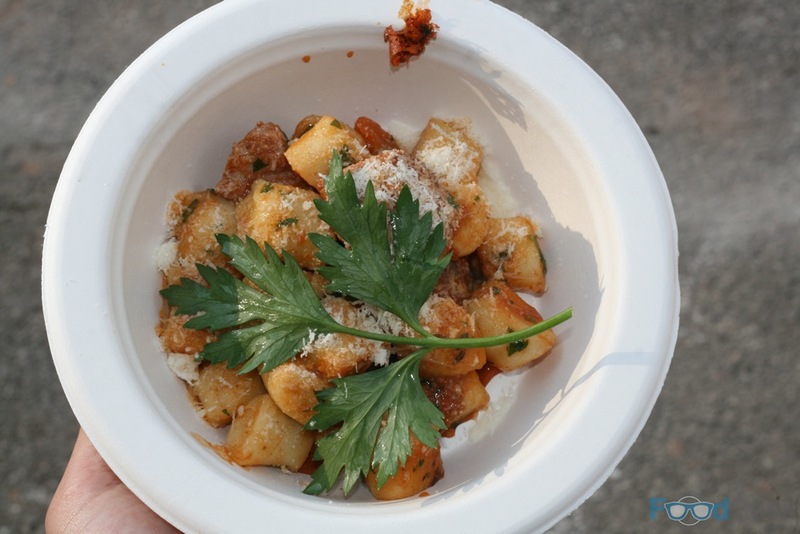 Both of their gnocchi dishes were fantastic, the gnocchi itself was amazing quality, Pasta e Basta pride themselves on making their pasta and gnocchi in small quantities from the best ingredients and it really shows. The meat dish was packed with generous chunks of incredibly tender slow cooked pork but it was the vegetarian version that I loved the most, gorgeous pink roasted beetroot gnocchi with a creamy blue cheese sauce, topped with crunchy nuts and rocket. Staying in northern Italy (Lombardia) for seriously fresh pasta from ‘Cooking Cooks’. 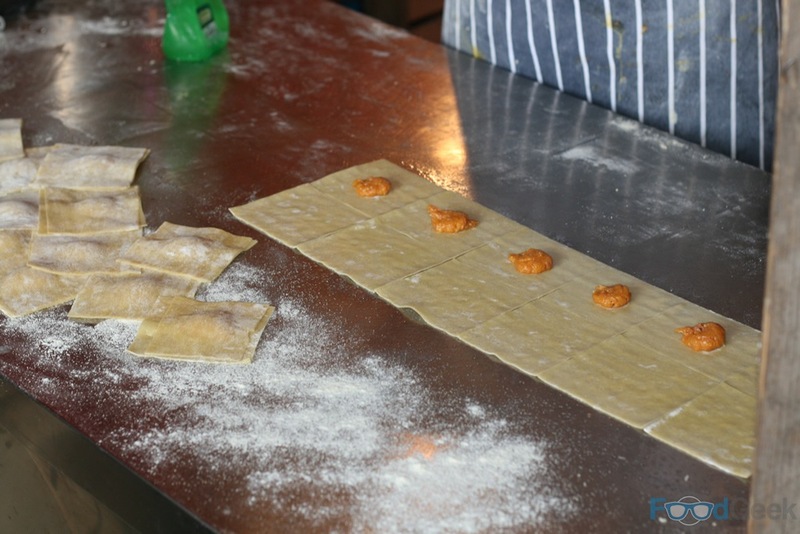 Ravioli made to order right in front of us filled with butternut squash puree and dry-cured ham, speck. I’d enjoyed everything so far and still had Pizza Pilgrims to come. 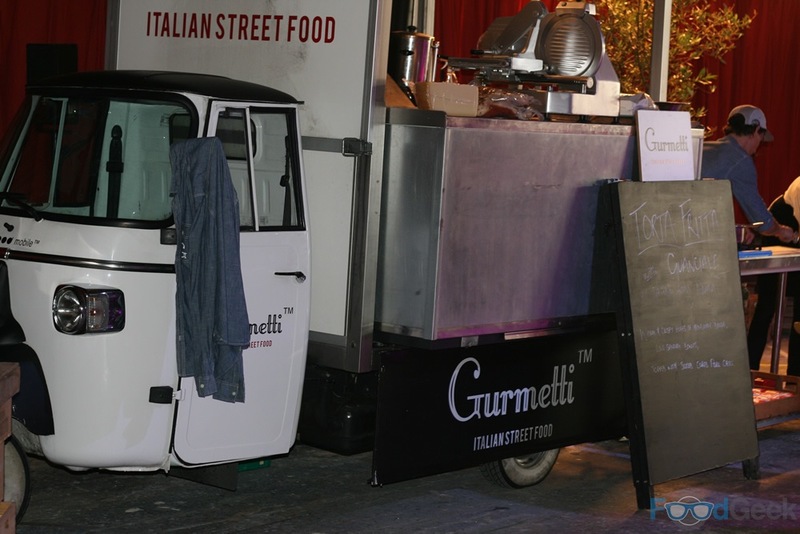 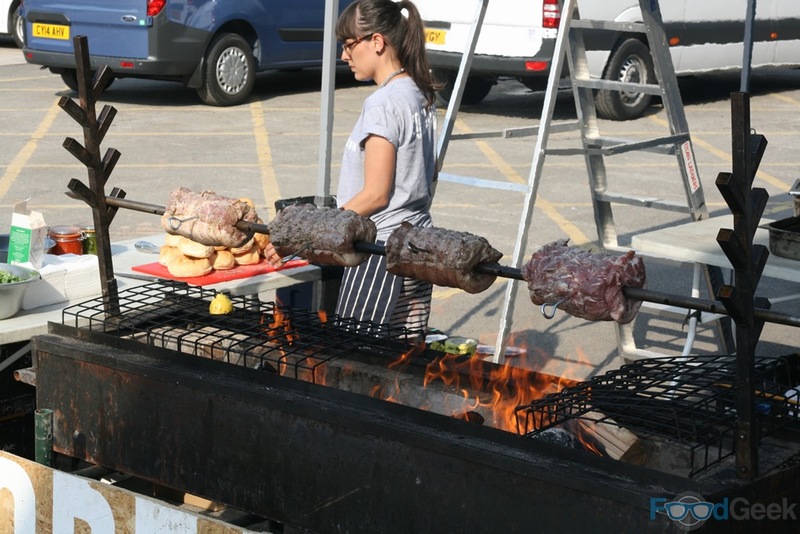 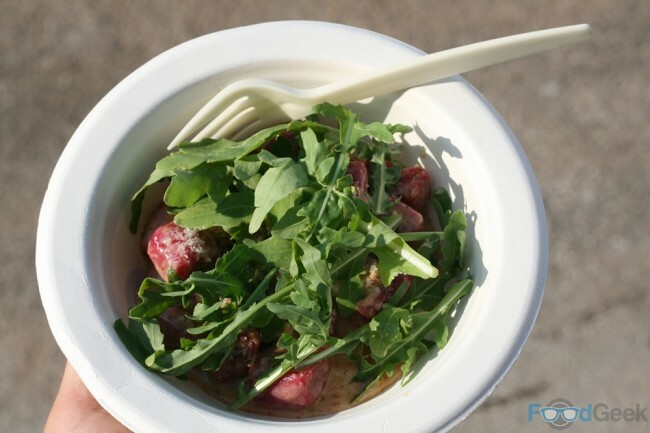 Check out my Street Feast post for a little more background on them and why I came to this event purely because of them. They didn’t let me down; although I was a little disappointed they were only doing their Margherita as i’d have loved to have the Nduja again or try another version. The disappointment only lasted until I tasted it though, within seconds all was forgiven. 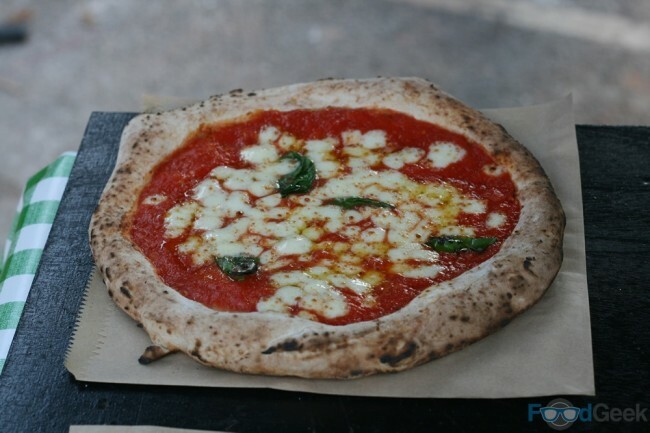 It was every bit as good as I remembered from London, the bases are just stunning and don’t need anything more than tomato sauce, cheese and a little basil. Pizza really doesn’t get any better than this! 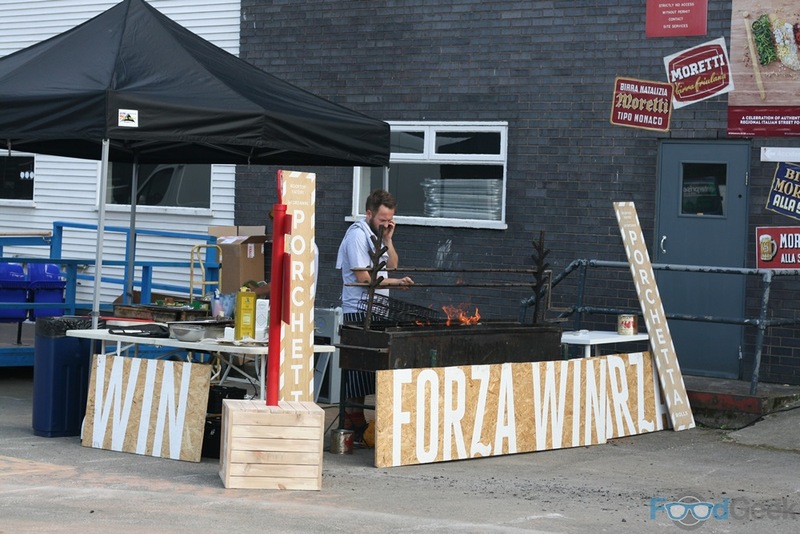 Sadly I didn’t get to try the amazing looking (and smelling) porchetta from ‘Forza Win’ as it wasn’t ready on time and then apparently they started taking names and ‘sold out’ before I got chance to put mine down. 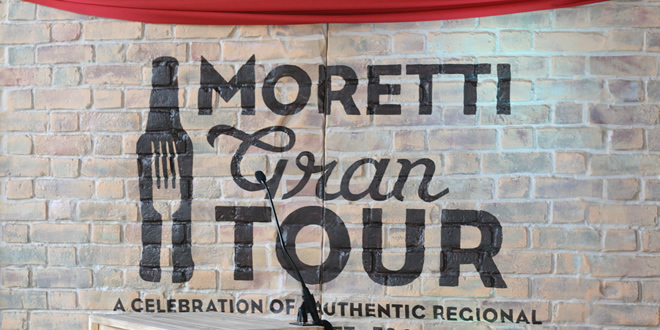 Pretty frustrating considering I was the first person there. 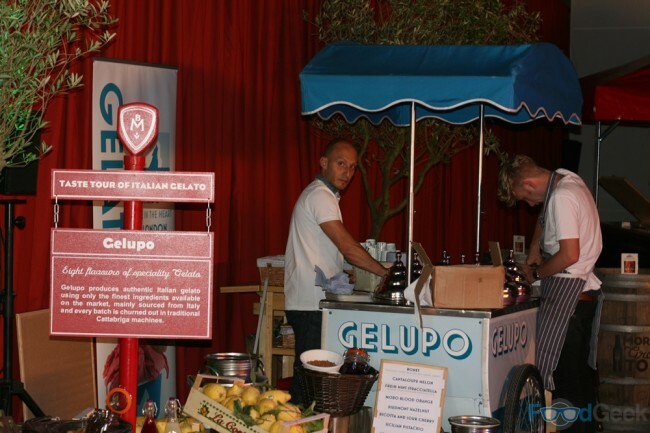 Dessert came from ‘Gelupo’ who produce authentic Italian gelato using ingredients mainly sourced from Italy. 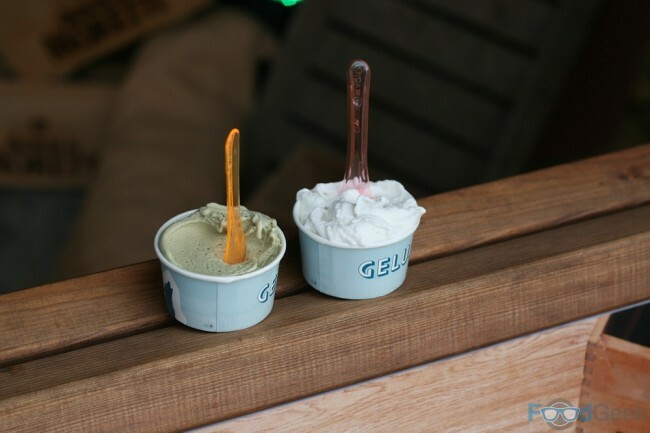 They had a range of interesting flavours available including the ‘Sicilian Pistachio’ & ‘Sorrento Lemon & Sage’ which I tried. Both were great, the quality of ingredients is obvious and the flavour combinations worked so well. There’s only one way to end an Italian feast, with quality Italian coffee! 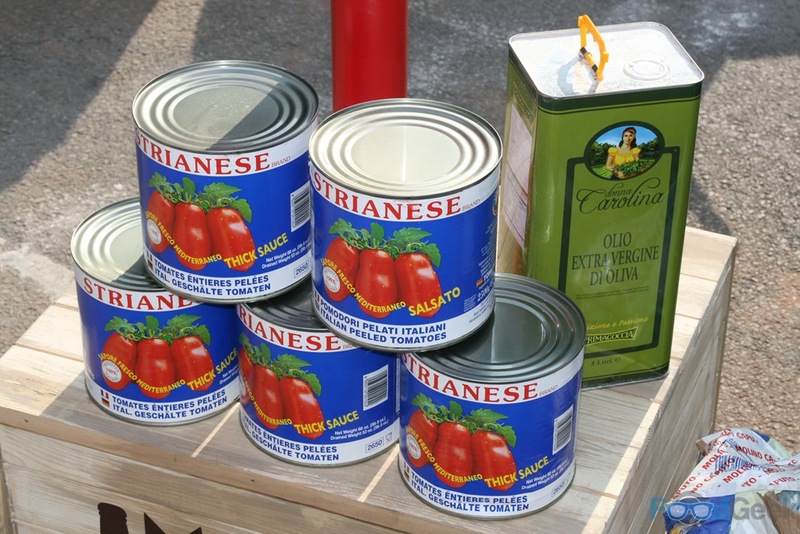 That’s exactly what we got from Edy and his ‘Terrone & Co.’ stall. 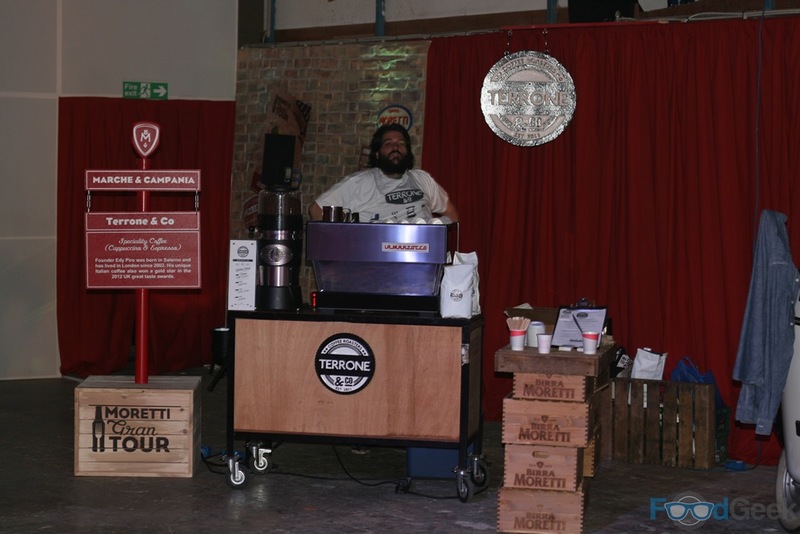 Born in Salerno but living in London since 2002 his stunning Italian coffee won a gold star in the 2012 UK great taste awards and was one of the best espressos i’ve ever had. As the name suggests drinks were provided by Birra Moretti. 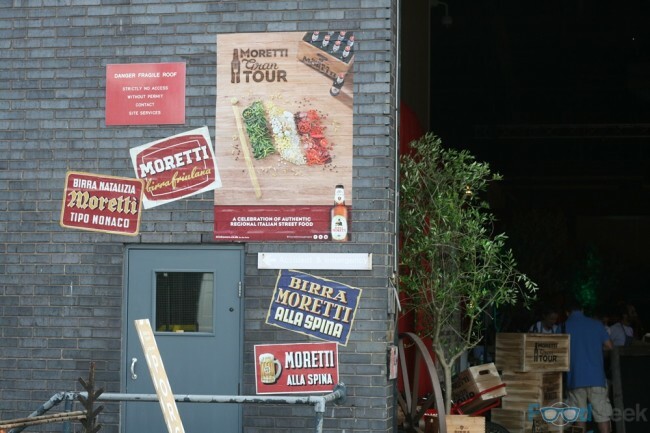 As a fan of craft beer they’re obviously not something I generally choose to drink, a little too commercial for my tastes. 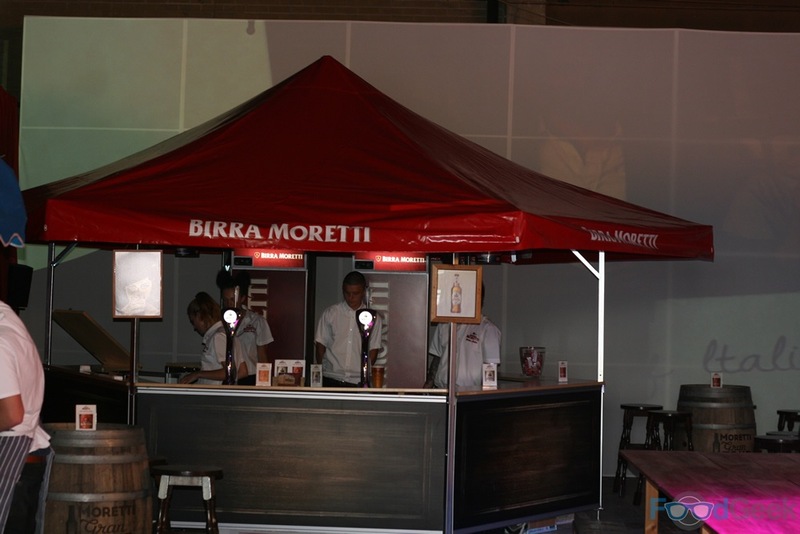 Although I must admit, a couple of ice cold pints of their regular lager did go down rather well with the Italian food and hot weather and I enjoyed trying their doppelbock, ‘La Rossa’ for the first time. 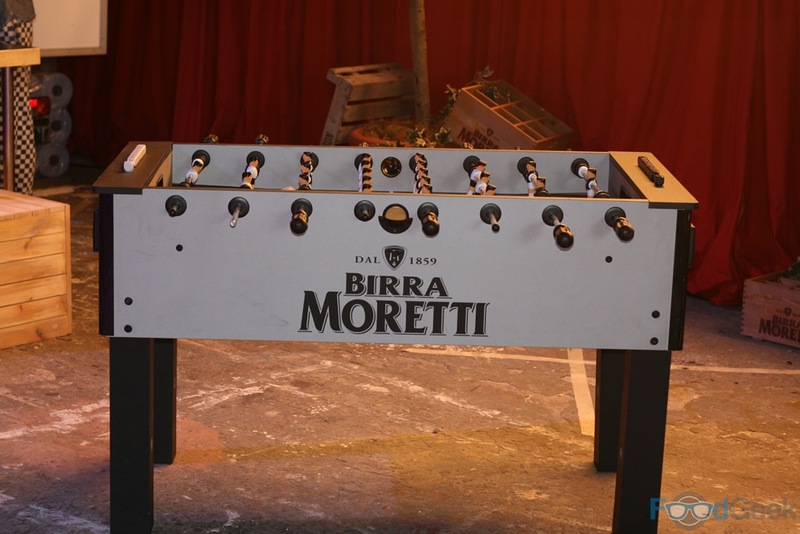 More importantly than how good the beer is though is the fact that Birra Moretti put this event together in the first place. 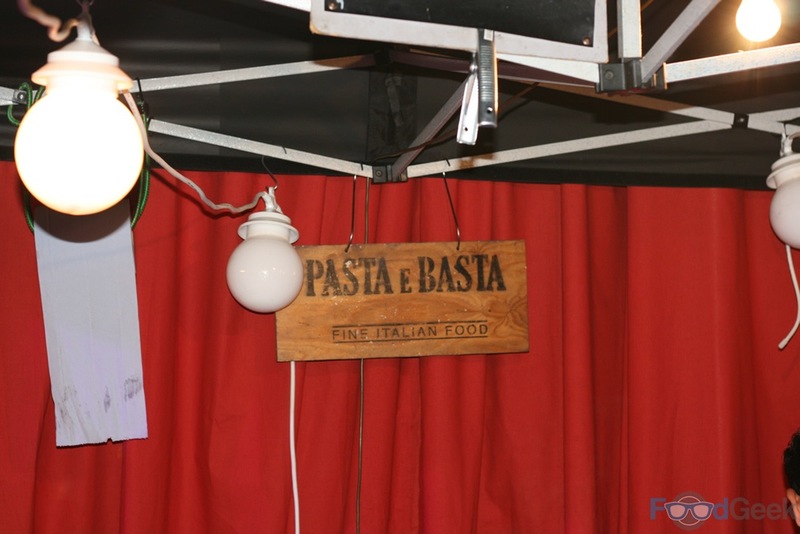 Their sponsorship allowed prices to be kept incredibly low; the £10 ticket price included 2 plates of food, an ice cream, a coffee and a beer! 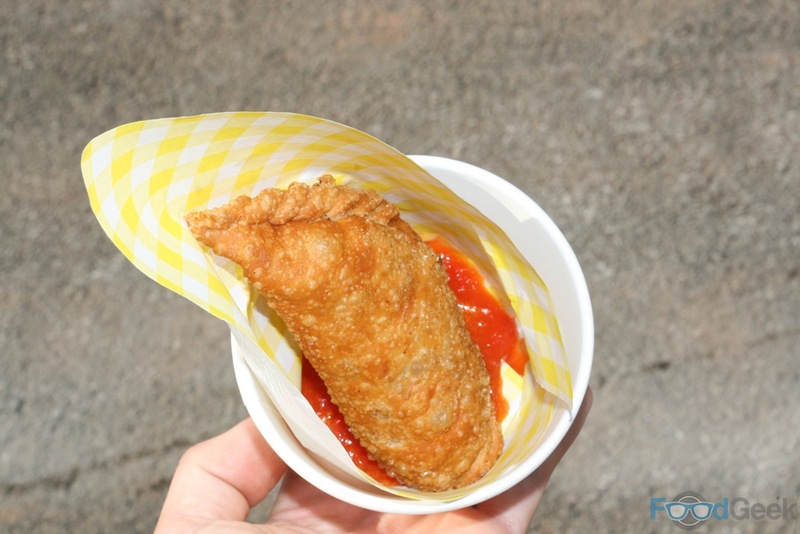 It’s a great idea and a fantastic way to support and promote street food so i’m totally in favour of it and hope to see more of the same from other big brands. I had a brilliant time at Moretti Gran Tour, although I only went for Pizza Pilgrims who did manage to live up to my extremely high expectations I loved everything else that I ate too and was very impressed with the quality of cooking and produce, further proof that the London street food scene is incredibly strong at the moment. Old Granada Studios is a great venue too, I hope to see many more similar events there in the future. Disclaimer: I was invited to the event as a guest, however, as Pizza Pilgrims number one fan I had every intention of going anyway.